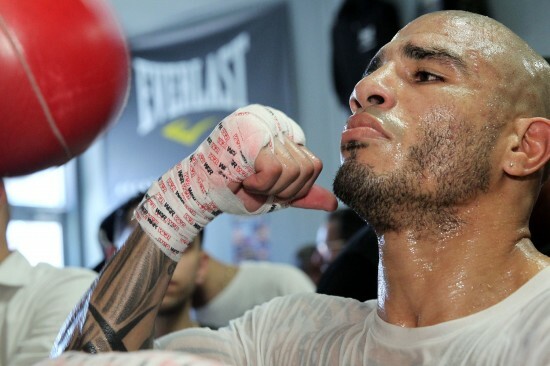 Locked and Loaded: Cotto Ripped, Ready to Face Martinez This Saturday! HOBOKEN, NJ, June 3, 2014 — Three-time world champion Miguel Cotto of Puerto Rico works out during media day Tuesday in Hoboken, New Jersey for his eagerly-anticipated World Middleweight Championship against WBC world Middleweight champion Sergio Martinez. Promoted by Miguel Cotto Promotions, Top Rank®, DiBella Entertainment and Sampson Boxing, in association with Maravilla Box, Tecate and Madison Square Garden, the Cotto – Martínez World Middleweight Championship event will take place on Saturday, June 7, at the “Mecca of Boxing,” Madison Square Garden and is produced and distributed live by HBO Pay-Per-View®, beginning at 9:00 p.m. ET / 6:00 p.m. PT.